Haibo Zhao, M.D., Ph.D., associate professor of medicine and physiology, recently published work in JCI Insight, furthering science's understanding of how bones maintain the proper density, which has implications for multiple health conditions. Jan. 5, 2017 | Jan. 5, 2017 | A team of University of Arkansas for Medical Sciences (UAMS) researchers have made key advances in the understanding of how bone is maintained, opening new avenues for the development of treatments for osteoporosis, arthritis and bone metastasis of certain types of cancer. 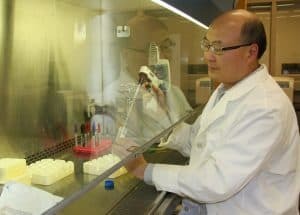 Haibo Zhao, M.D., Ph.D., associate professor of medicine and physiology in the Department of Endocrinology and the Department of Physiology and Biophysics in the UAMS College of Medicine – published his findings recently in JCI Insight, a leading peer-reviewed journal in biomedical research. Zhao’s work improved scientists’ understanding of osteoclasts – bone cells that remove old or damaged bone. Other cells – called osteoblasts – come behind osteoclasts and form new bone. Both cells must be functioning properly for bones to grow and stay strong. Zhao works in a lab in the Center for Osteoporosis and Metabolic Bone Diseases at UAMS. For example, in osteoporosis, osteoclast activity outpaces that of osteoblasts, meaning a greater amount of bone is removed than is replaced. This causes bones to weaken and become more susceptible to fractures. Scientists have previously outlined this relationship between the cells that remove old bone and cells that form new bone, but Zhao’s work focused on what causes osteoclasts to malfunction, which is less understood. Zhao targeted a specific type of protein – PLEKHM1 – and demonstrated that its absence decreased the function of the osteoclasts. Further investigation found that the protein is a critical factor in some of the intracellular functions – specifically involving lysosomes – that are essential for osteoclasts to operate. After determining its function, the next step will be to better understand PLEKHM1’s structure so that it can be targeted by drugs that could treat osteoporosis and other bone conditions in which osteoclasts malfunction. Zhao has already secured National Institutes of Health funding to pursue this next step, along with Kottayil I. Varughese, Ph.D., professor in the Department of Physiology and Biophysics, who is co-principal investigator on the project. “Dr. 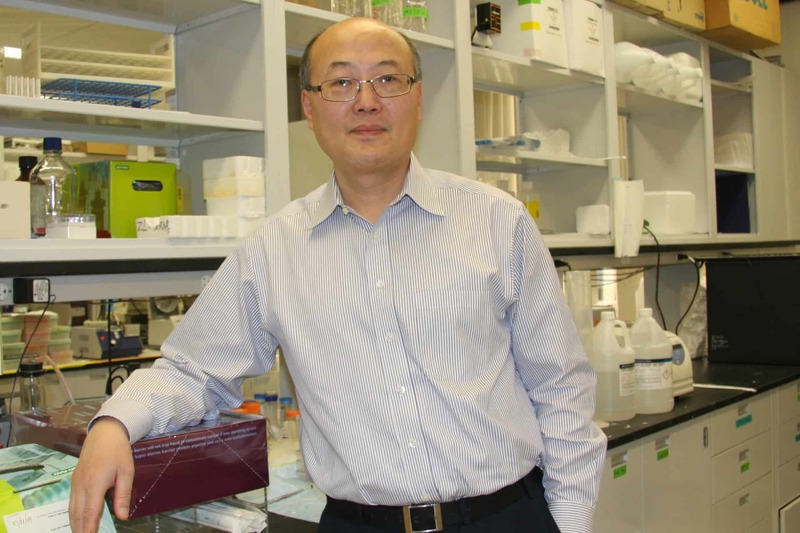 Zhao is a very talented and internationally recognized researcher in the basic biology of osteoclasts,” said Stavros C. Manolagas, M.D., Ph.D., director of the UAMS Center for Osteoporosis and Metabolic Bone Diseases, which partially funded Zhao’s research. The article, titled “PLEKHM1/DEF8/RAB7 complex regulates lysosome positioning and bone homeostasis,” was published Oct. 20. UAMS faculty who assisted with the work were Manolagas; Varughese; and Daniel E. Voth, Ph.D., of the Department of Microbiology and Immunology, and Samuel G. Mackintosh, Ph.D., of the Department of Biochemistry and Molecular Biology, both in the College of Medicine. Postdoctoral fellows Toshifumi Fujiwara, M.D., Ph.D.; and Shiqiao Ye, Ph.D., assisted with the work, as did graduate student Caylin G. Winchell, Ph.D. The work was funded by a grant from the NIH/National Institute on Aging to Manolagas and the Center for Osteoporosis and Metabolic Bone Diseases of more than $1 million a year for five years; and a grant from the NIH/National Institute of Arthritis and Musculoskeletal and Skin Diseases to Zhao of $220,500 a year for five years. The project’s next phase will be funded by a grant from the NIH/NIAMS to Zhao and Varughese of $135,000 a year for two years. Zhao received his Ph.D. and M.D. from Tongji Medical University in Wuhan, China. He has been at UAMS since 2009. Previously he held a faculty position in the Department of Pathology and Immunology at the Washington University School of Medicine in St. Louis. His work on improving the scientific understanding of osteoclasts has spanned more than 20 years. The Center for Osteoporosis and Metabolic Bone Diseases, founded by Manolagas at UAMS in 1994, is one of the largest and longest-funded osteoporosis research centers in the world. The center has brought $83 million in grants to UAMS. Its researches have made seminal discoveries in pursuit of more effective therapies for the more than 10 million Americans who suffer from bone-fracturing osteoporosis and 34 million individuals with low bone mass.